• Situated on a private concession that allows guided walks, mokoro excursions and night drives in addition to game drives and motor boating (water levels permitting). 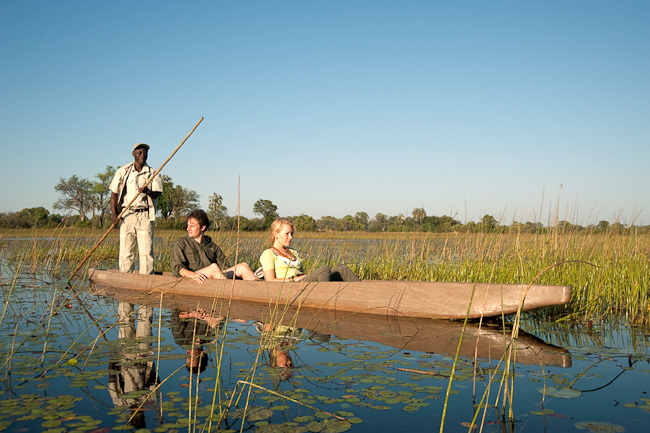 • Private access to one of the largest heronry's in the Okavango Delta by motorboat. • Excellent area for birding with regular sightings of Pel's Fishing Owl. • Fly or spin fishing throughout the year (best months May - November). At Kanana guests are accommodated in eight spacious, twin-bedded safari units, set on raised teak decks, offering breathtaking views across the waterways. Dependent on the annual floods, the level of water transforms this dry camp into a true water experience and in the early months of the year you may actually enjoy the visible spectacle of the water rising around the camp. All tents offer en-suite bathrooms with hot and cold running water, shower and flush toilet. The tents are well spaced affording privacy, whilst still being within comfortable distance from the central dining and lounge area. • 8 x twin-bedded spacious tents, set on raised teak decks, offering breathtaking waterway views. • Ensuite bathrooms with shower. • Tents are well spaced affording privacy, whilst still being within comfortable distance from the central dining and lounge area. Kanana's dining room, bar and sitting area overlook the Xudum River, with an inviting campfire set on the water's edge. Minimum age is 7 years from Mar - Jun and in Nov & Dec, however from Jul - Oct the minimum age is 10 years. Of special note is the birding in the area, Kanana hosting a seasonal heronry that teems with activity from August through to the summer months, a true highlight at Kanana which converts all visitors to avid 'twitchers' at first sight. Excellent area for birding, with regular sightings of Pel's Fishing Owl. Guided walks are highly recommended in this pretty area as well as spin fishing for tilapia, African pike and sharp tooth catfish. Open 01 Mar – 01 Jan.